Each of the 36 disks on the table combines 3 symbols reproduced in 3 different colors. Each turn, we roll 2 dice which indicate which symbol to find and in what color. Then all players simultaneously try to seize a maximum of records reproducing this combination. The records are magnetic: "Clac! 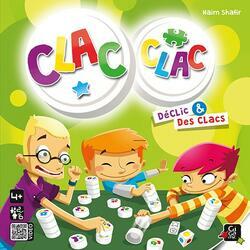 Clac! "They pile up like magic, but you can only use one hand! It is necessary to go very quickly to stack them without being mistaken, otherwise beware of the penalties ... Then we start a new tour. When all the discs have been picked up, the highest stack indicates the winner. Have a keen eye, clear mind and skillful hand!